Water cycle is one of the fundamental energy and matter transfer mechanisms influencing the human society in numerous ways. The knowledge of the underlying processes behind this cycle is a key issue to the sustainable water management. Water resources are nowadays (probably more than ever) influenced by human activities and ongoing climate change. Floods and drought are becoming more pronounced due to these changes. More often and prolonging drought periods raise the question of available water resources. Hence, numerous precaution measures for the enhancement of water retention within the landscape are proposed. Before these measures can be implemented, it is necessary to quantify their impacts by means of hydrological models. These models require field measurements of hydrological and meteorological data for their reliable simulations. The Institute of Hydrodynamics operates an experimental basis for such tasks and is therefore able to design a proper modelling instrument. Human activities and climate change are the main stress factors steadily altering the availability of water resources. The accumulated stress is then released by means of extreme hydrological situations such as floods and drought. It is necessary to adapt the water management on the presence of these situations as namely the climate change is driven by the forces human society cannot alter promptly. Hydrological modelling of water cycle and its components enables the description of the consequences of ongoing changes, their predictability and the assessment of mitigation strategies. For the determination of the most vulnerable regions, the spatial distribution of soil moisture and its modelling is an essential tool. Moreover, precise information about an amount and distribution of water within the landscape (together with other factors such as land use, water consumption, climate characteristics) is a substantial variable governing the rainfall-runoff response. Evaporation of water from the landscape is after precipitation the second most prominent flux within the continental water cycle (around two-thirds of water that falls on the land surface is returned back to the atmosphere by means of evaporation). The water retention is therefore strongly influenced by the amount of water leaving the landscape in a form of gas and the precise quantification of this amount is of high importance. Moreover, in the changing climate, this amount of water is even supposed to rise. 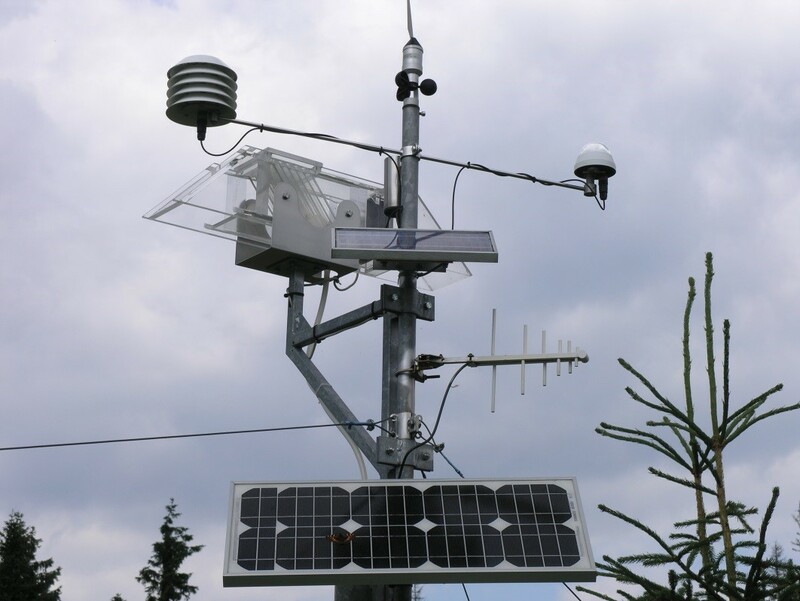 Measurement of evapotranspiration is difficult as it is highly spatially variable and influenced by numerous factors – air temperature, air humidity, wind speed, incoming solar radiation, soil water, vegetation cover etc. Unfortunately, the measurements are usually only point scale and encompass significant amount of uncertainty. Evapotranspiration is therefore estimated by means of mathematical equations for the practical purposes. In the first place, potential evapotranspiration is determined – denoting maximum rate of evapotranspiration under the conditions of sufficient water supply. This rate is subsequently reduced to actual evapotranspiration based on the available soil moisture content and growing stage of vegetation. Lately, the hydrological research is focused namely on such complex parts of the water cycle, whose importance rises in the context of climate change (winter and nocturnal transpiration, interception, deposited rainfall and their influence both on water and material balances). Soil water retention can be modelled reliably only when based on the thorough knowledge of the main interactions in the soil-plant-atmosphere system. In hydrological models of larger scale, the soil water fluxes are usually represented in a very simplified form. This is namely due to the lack of input data/model parameters and time-consuming calculations. The comprehensive analyses of the model efficiencies are nowadays limited to a very small highly-equipped experimental sites and vegetation season. The detailed description of the underlying processes influencing the soil water regime will lead to reinforced forecasting of floods (focused both on events caused by rainfalls of high intensity and long duration) and drought. During the International Hydrological Decade (IHD; 1965 – 1974), introduced by the UNESCO programme, many small experimental catchments were established. The main aim was to study the hydrological processes at the basin scale. Only well-defined catchments with intensive research of physical, chemical and biological processes can bring a light into the water cycle fluxes (their quantity, pathways, and residence times). Due to the effort of having defined boundary conditions and water/matter fluxes, the small experimental basins represent multidisciplinary natural laboratories. Especially in the context of the ongoing changes in the environment (climate change and other human activities), the long-term observations become more significant as it is necessary to distinguish between those changes and naturally present hydrological non-stationarity. Research of the Hydrology group is focused namely on precise quantification of particular components of the water cycle. Total evapotranspiration (evaporation from various surfaces + transpiration of vegetation) is estimated based on measured solar radiation, sap flow within the trees, evaporation from free water surface and interception. Soil water fluxes/retention are determined by means of hydrological and hydropedological models with the use of soil water potential/content measurements at several depths. The soil moisture measurements are conducted at several places as soil is a heterogenous system influenced e.g. by the presence different vegetation cover (meadow/deciduous forest/conifer forest). The Institute of Hydrodynamics operates several such sites in the upper part of the Šumava Forest. These measurements can be used for the model parametrization, which can be further used in the catchments without such extensive monitoring. In the larger scale, the research is focused on the impact studies trying to quantify the influence of climate change and adaptation measures (presence of small retention reservoirs, land use change, altering soil properties, etc.) on particular components of water cycle. Among the water cycle components, the special attention is paid to the soil moisture content and the rate of evapotranspiration. Šípek, V., Tesař, M., (2017). Year-round estimation of soil moisture content using temporally variable soil hydraulic parameters. Hydrological Processes. 31(6), 1438-1452. Oulehle, F., Chuman, T., Hruška, J., Krám, P., McDowell, W. H., Myška, O., Navrátil, T., Tesař, M., (2017). 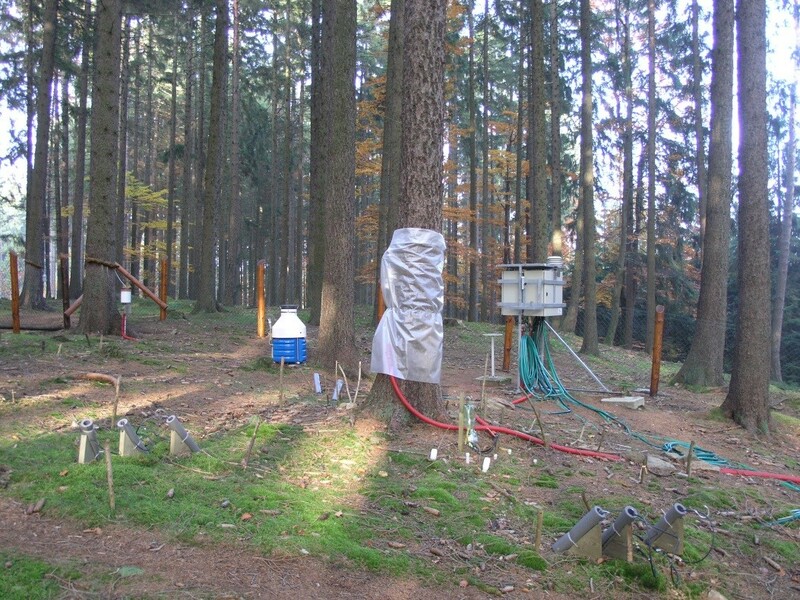 Recovery from acidification alters concentrations and fluxes of solutes from Czech catchments. Biogeochemistry. 132(3), 215-272. Šípek, V., Tesař, M., (2016). Validation of a mesoscale hydrological model in a small-scale forested catchment. Hydrology Research. 47(1), 27-41. Oulehle, F., Kopáček, J., Chuman, T., Černohous, V., Hůnová, I., Hruška, J., Krám, P., Lachmaová, Z., Navrátil, T., Štěpánek, P., Tesař, M., Christopher, E.D., (2016). Predicting sulphur and nitrogen deposition using a simple statistical method. Atmospheric Environment. 140, 456-468. Šípek, V., Daňhelka, J., (2015). Modification of input datasets for the Ensemble Streamflow Prediction based on large scale climatic indices and weather generator. Journal of Hydrology. 528, 720-733.